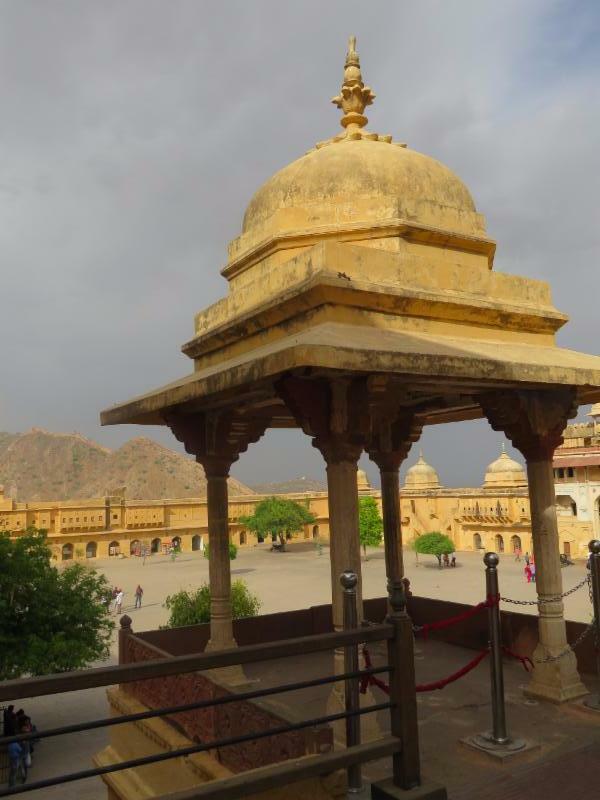 JAIPUR, INDIA: A HELLUVA STORY (Part 4 in a Series) - Travel with Teri B. Why is the drive from Ranthambhore to Jaipur nearly four hours in length when it is only about 100 miles (180 km)? Because a “major” road in India can mean just two lanes in each direction. 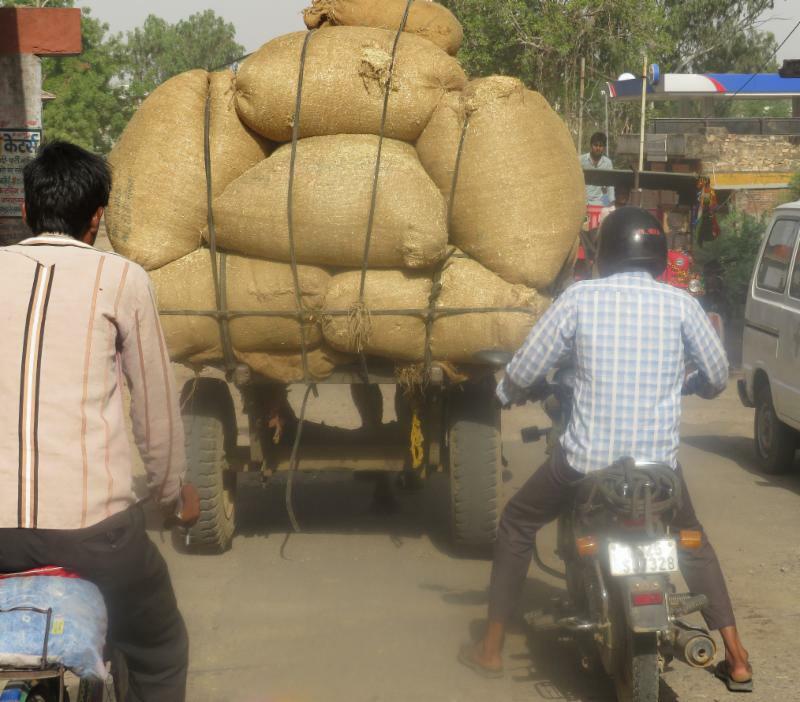 Mind you, few drivers actually pay attention to traffic lanes, not to mention dodging all the animals, motorbikes, and enormous sacks of hay. “Wide load” to say the least! 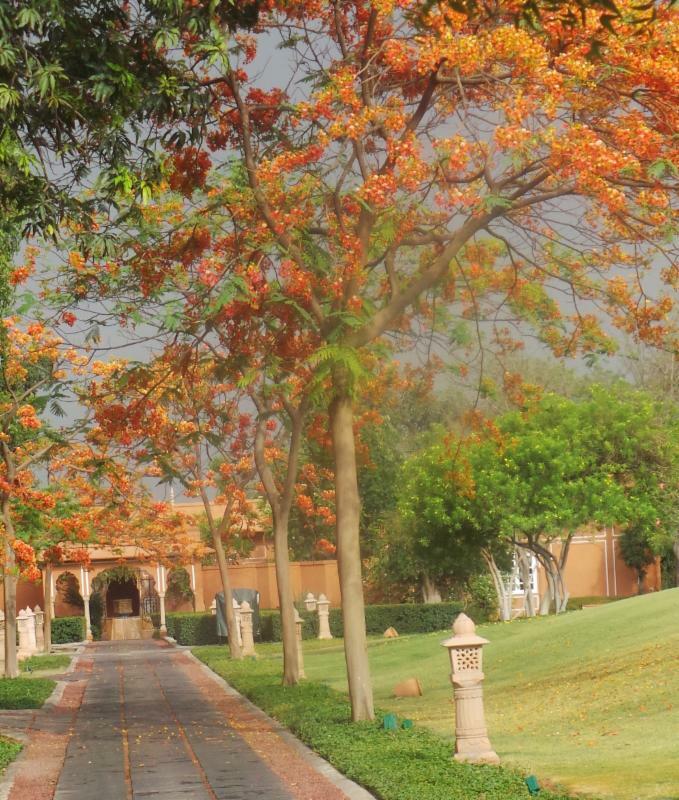 Arriving at the Oberoi Rajvilas is indescribable. It is a true oasis on 32 acres of lush grass with peacocks in abundance. It is just a gift. And we thought we’d seen some pretty wonderful welcome amenities, but hand’s down this property gets #1 status. Witness below the edible chocolate. How in the world …?? Someone across the planet reads my blog! I am honored. 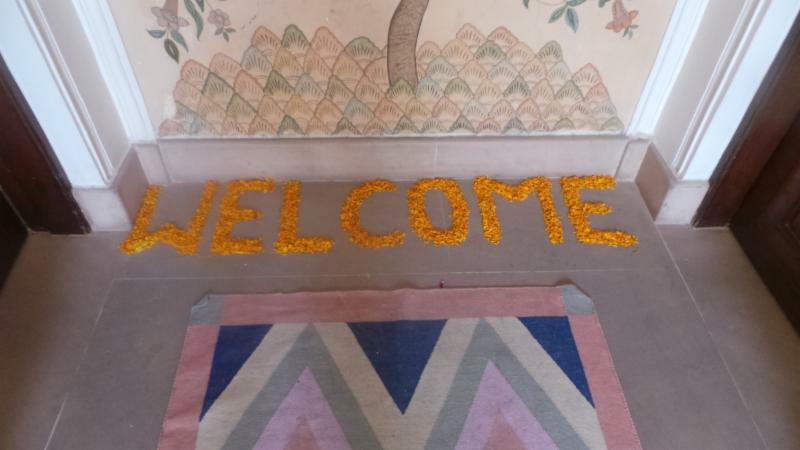 marigolds are used liberally for messaging (below). Remember “Best Exotic Marigold Hotel”? 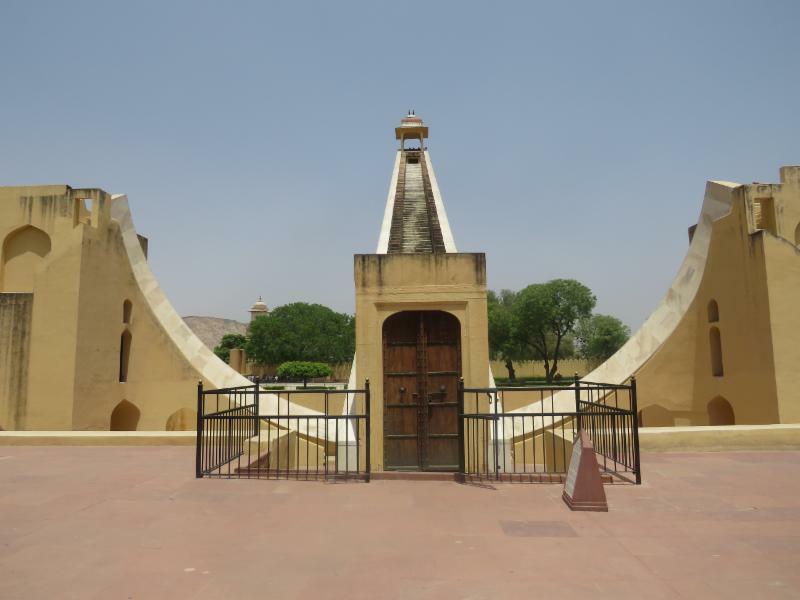 Filmed in and around the Jaipur area. 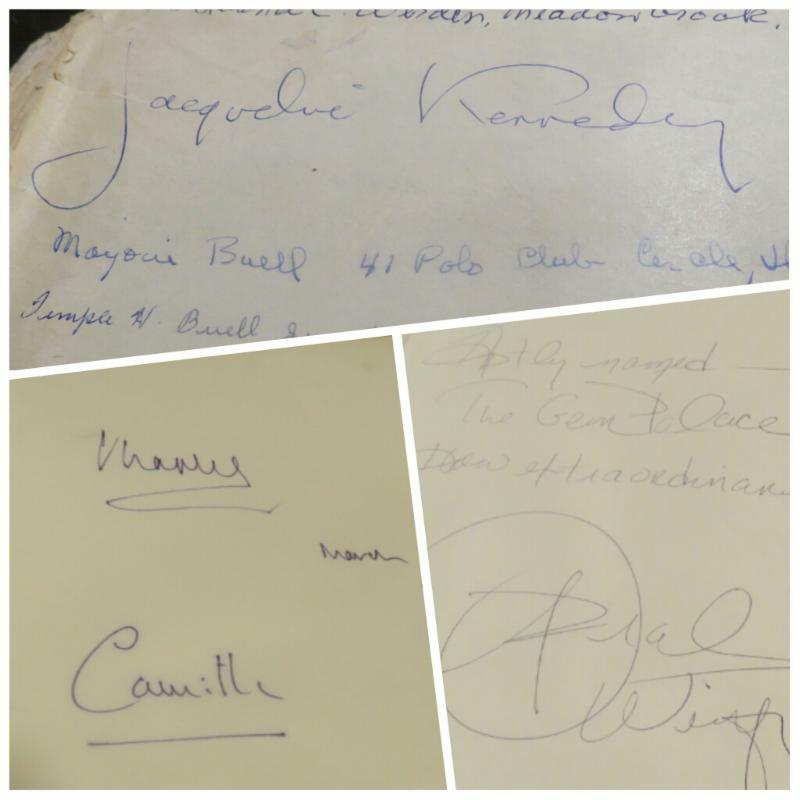 In case it’s not clear: Jacqueline Kennedy (top; circa 1962); Charles & Camilla (bottom left; circa 2006); Oprah (bottom right; 2012). We were in very good company to say the least! Alas, no acquisitions. We had a lengthy and fascinating conversation with 8th generation propietor/scion Samir Kasliwal, at the end of which he showed us some incredible commissioned pieces. 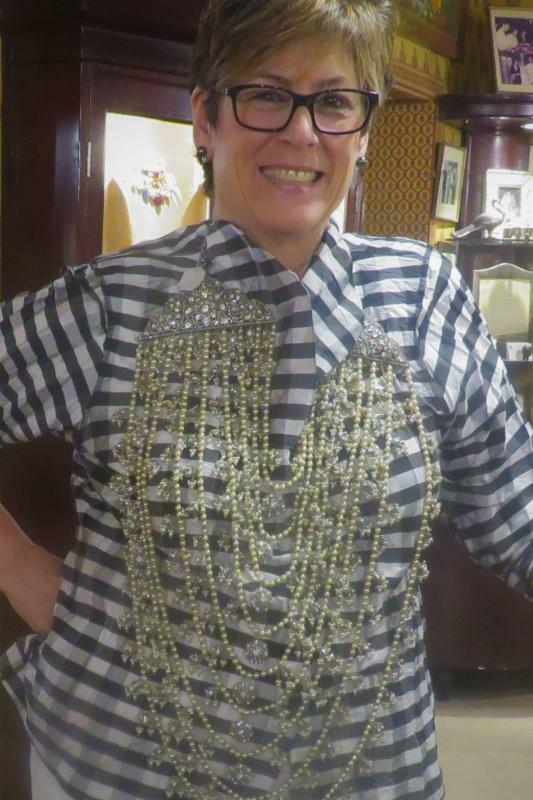 I couldn’t resist trying on the 900-carat “chandelier” made for a Kuwaiti royal (as heavy as it looks). Somehow we started discussing our next stop — Udaipur. Yours for about a million bucks. 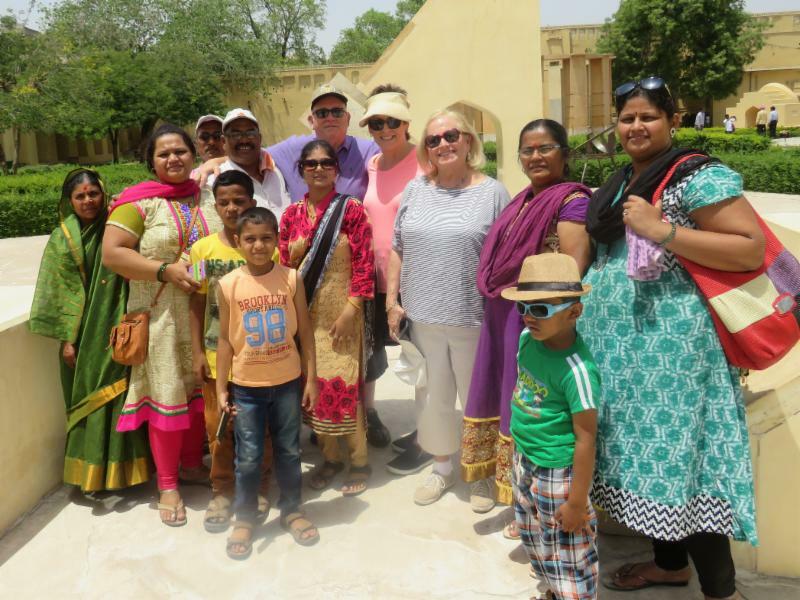 Back story: Before leaving home, we were informed by our tour company andBeyond that all 82 rooms at the Oberoi Udaivilas, plus the other comparable area hotels, had been bought out for a wedding during our scheduled visit and would we consider switching our plans. Firmly no. There’s no way we’re missing this place! Of course, guess who’s going to the wedding? Our new friend Samir! And since andBeyond personnel knew the groom, we would be welcome to attend .. along with the 1,200 or so other guests. What’s a few more? Wedding highlights in the next post. 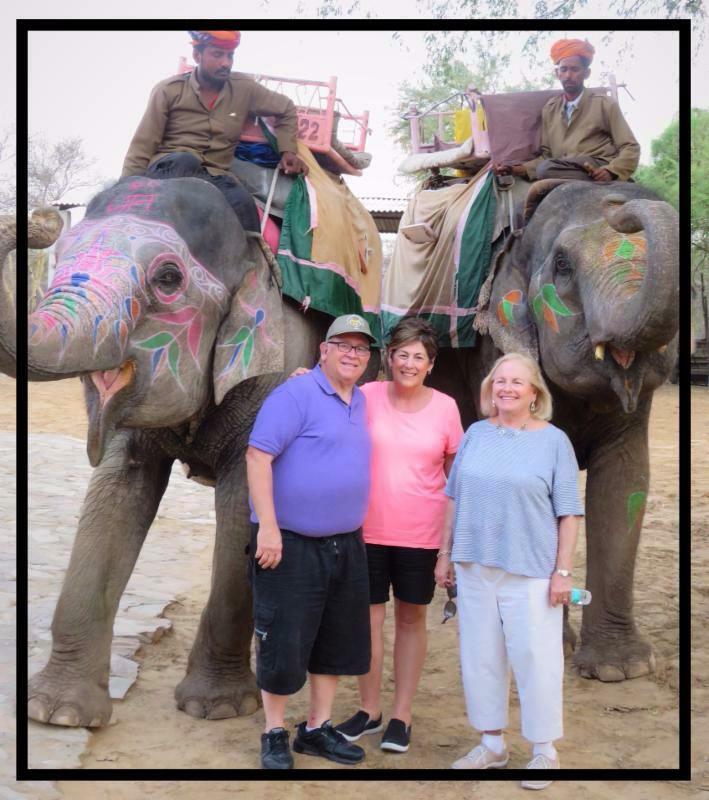 While in Jaipur we had a full day of sightseeing the historic sights, culminating with an elephant ride and dinner at Dera Amer. 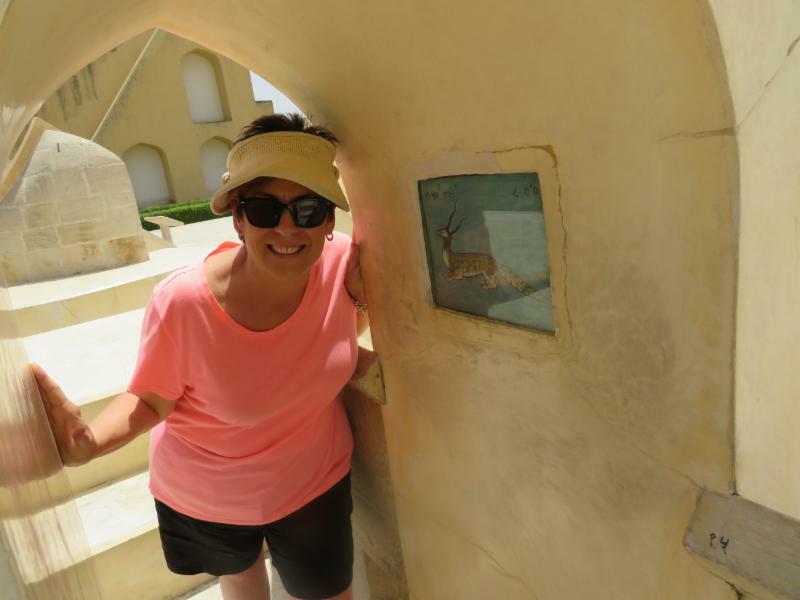 The following day, it was a challenge getting up for a 6:30 a.m. hotel departure to the airport for the short flight to our next and final stay in India: Udaipur…. 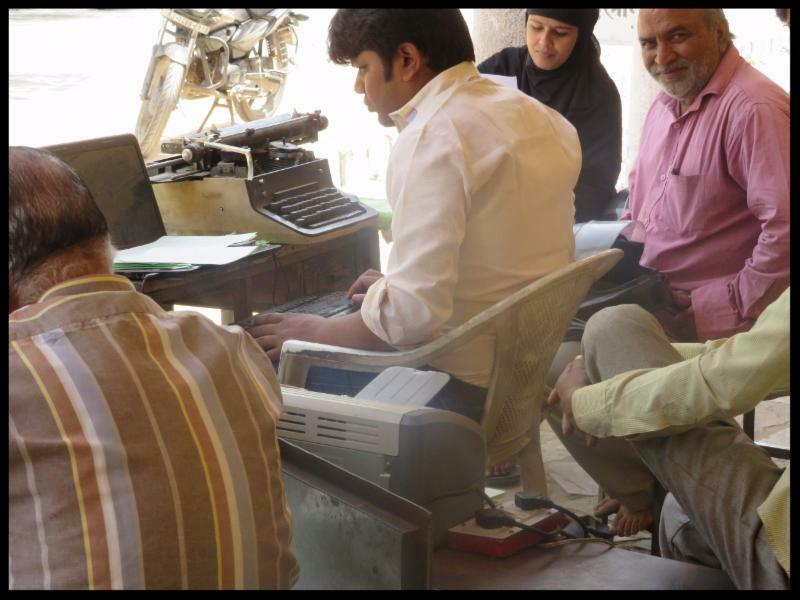 Can you guess what this gentleman (facing the laptop) does for a living? Notary Public. Fax/typewriter/computer — the works. Inside the walled city on our tour. 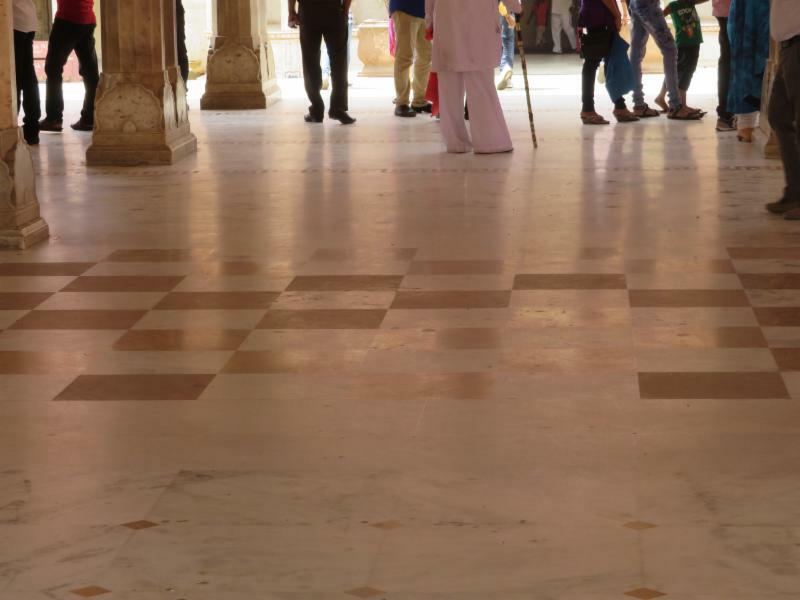 Clockwise from upper left: Next to my Capricorn sign at Jantar Mantar, a Unesco World Heritage site with 19 “architectural astronomical” instruments built in the 1700’s; with our new Indian “friends” who love being photographed with Americans — mostly selfies; inlaid lifesize chess board — we heard something about the rulers using concubines as chess pieces; and the world’s largest sundial. The hubby still can’t believe I used the word “hypotenuse” when we were there, but I will keep reminding him I did pay some attention in high school. 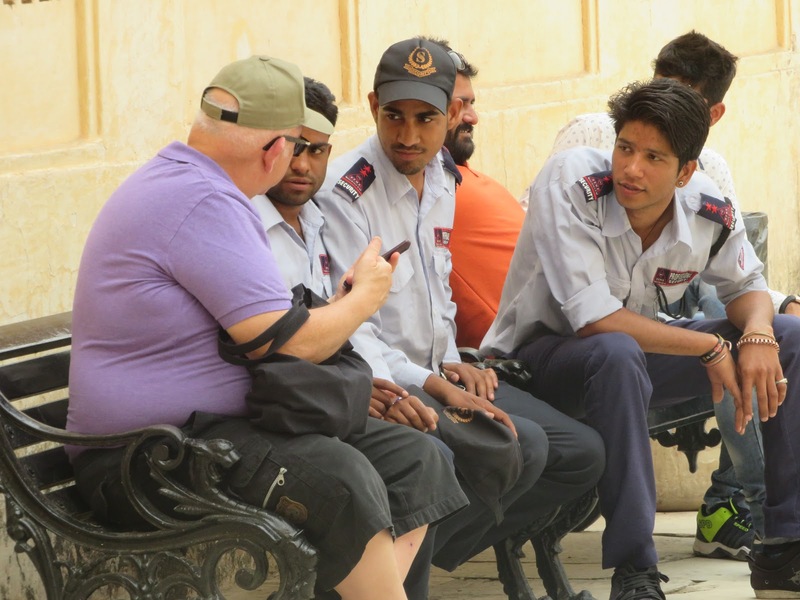 The hubby in deep discussion with Fort guards — about “Fast & Furious” movies! 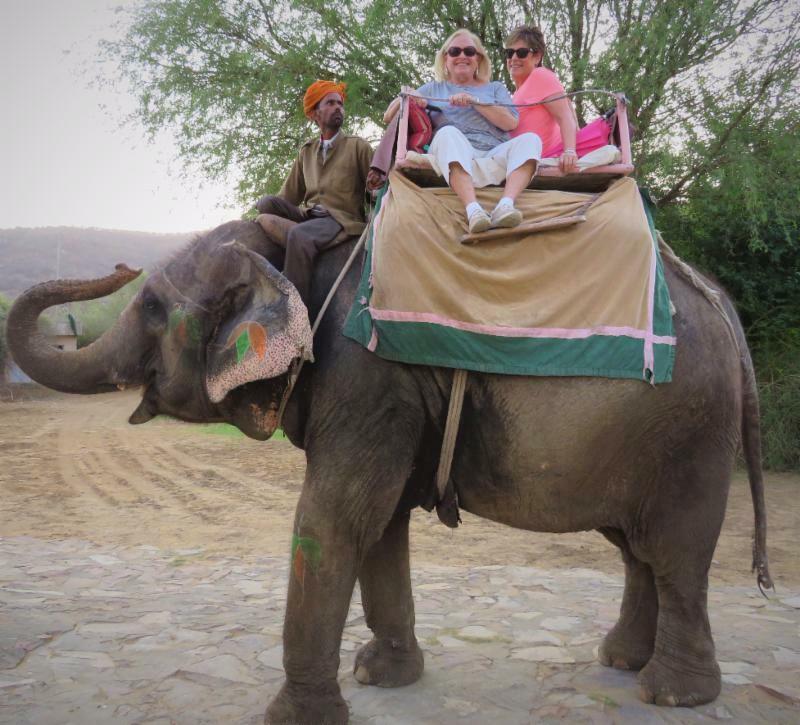 Traveling companion/Aunt Judy Stone & I lasted about 15 minutes … love the elephants but the ride is VERY bumpy!